Call today: 1-800-655-9100 to talk to one of our Dewatering Equipment Specialists. 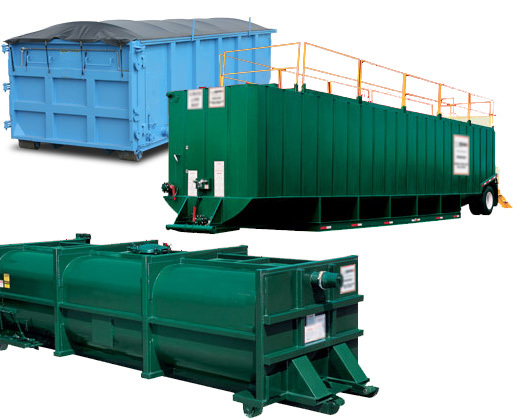 Roll-off style dewatering boxes are available for immediate delivery and are a fast, economical way to separate liquids from a wide variety of solid wastes. These boxes are frequently used for oilfields, refineries, petrochemical plants, ground water treatment, soil contamination clean up projects, construction projects. Common applications include dewatering alum sludge, fly ash, lagoon and digested sludge, clarifier bottoms, slurries, grit, screenings, grease trap wastes, pipeline maintenance, septic waste and many other types of commercial and industrial wastes. Roll off container filters can be used for removing solids from storm water runoff and clarifying many types of industrial waste streams. Waste streams and materials can be pumped or conveyed directly into the roll-off container box for dewatering and subsequent proper transportation and disposal of solid wastes. Complies with regulations for landfill disposal.